Every Woman from a very young age (consciously or unconsciously) has developed a definition of what it means to be a Woman. This definition has shaped our perspective, choices and how we express our Identity, Womanhood and Femininity. This not only effects us but everyone our life has been called to touch. As Kingdom Women it is NOW our responsibility to analyze and define this definition. Answering questions like, “Who am I?” and ”What is my Purpose as a Christian Woman?” can be some of the hardest, most challenging questions in a Christian Woman’s life. For many women, our lives have been impacted and defined by the culture, life experiences, or the decisions we’ve made on our own about how to define and live out our Identity and Womanhood. Before we can ever answer these questions, we must overcome the #1 Temptation and purposefully decide to trust and allow God’s purpose and plan for our Identity to be reflected through our lives, but this is not always an easy task. Because of this challenge, many women fail to covenant their their Identity and Womanhood to God, and in turn, they end up dealing with an Identity Crisis, not truly understanding that God sees women as His Image Bearers and we reflect who he is in the earth through our Identity and Womanhood Journey for his purpose and glory! Don’t despair; you are not in this journey alone. Eve had the same challenges with the #1 Temptation. Through examination of Eve’s Dilemma, Stephanie Kirkland gives us a comprehensive look at the importance of making a covenant regarding our Identity to the purpose and plan of God, which helps us build our Identity, Womanhood and Purpose. Eve will inspire and help us look at ourselves by using her life story as a mirror for our own journey. Through her life we see ourselves. We see our challenges. We see our questions. Now, get your answers. 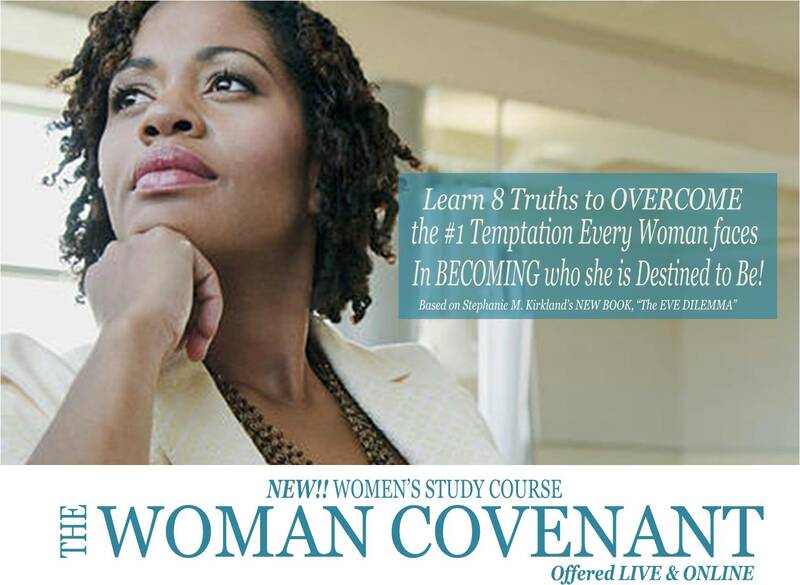 By following the 8 principles laid out in Isaiah 32, you will have the foundational information and tools to help you covenant your Identity to God and overcome the #1 temptation every woman will face in becoming who she is destined to be. You will understand that through God, each of us can become fully and freely the Women he created and redeemed us to be, and fulfill our purpose as his Image Bearers in the earth through our Identity and Womanhood Journey. Monday’s, April 28 st – June 16th 11:00 – 12:30 p.m.
OR Thursday’s, May 1st – June 19th 7:00 p.m. – 8:30 p.m.
Includes Book, Workbook, CD. Options: T-Shirt and/or Journal if you have book or workbook. Book Promotional Price of Course $65.00 Shipping & Handling is in addition to cost. Purchase Deadline for ONLINE Course: May 2nd. The 8 Lessons are available on week by week basis.